What’s the next best thing to Man’s Night? 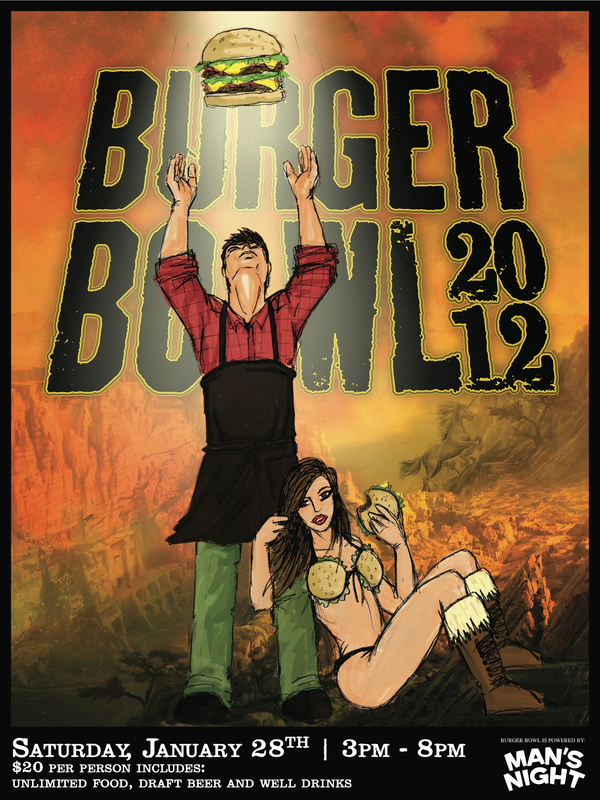 Burger Bowl 2012! Hosted by Man’s Night, Burger Bowl is a local contest, where homemade burgers are submitted to be judged on taste, presentation and uniqueness. This years event will be held on Saturday, January 28th @ Ireland’s Own, 2163 Seneca St. Buffalo NY 14210 – BURGER BOWL IS OPEN TO THE PUBLIC – any and all are welcome to attend. $20 per person includes unlimited food, draft beer and well drinks. Man’s Night pulled pork sandwiches will also be available as part of the festivities. Burger Bowl will start promptly at 3pm. Open bar will continue until 8pm. This is an event no burger lover will want to miss and this year’s Burger Bowl will also feature a special celebrity guest: Chef Brian Duffy from Spike TV’s Bar Resue. Feel like getting in on the judging action? For an extra $10, you can become a Spectator Judge. You’ll be guaranteed to sample all eleven burgers in competition and will vote on which burger you think is the best. There are only 20 spots available so email mansnightmeat@gmail.com if you’re interested.